Comment The Strategic Defence and Security Review of 2010 was, overall, a total cockup: but there was one major decision in it which made good sense for British servicemen and taxpayers. It now seems more and more likely that Prime Minister David Cameron, prompted by arms mammoth BAE Systems and by the RAF, intends to reverse that move and continue the destruction of British combat power which has been underway now for more than a decade. That's a lot of doors and lids and motors ... and all stealthed. Ouch. We refer, of course, to the choice of which version of the F-35 stealth jet the UK is to buy - which determines what equipment Britain's future aircraft carriers will need. This choice should be nice and simple. The F-35C, intended for catapult launch and tailhook/arrester-wire landing, will be much cheaper than the jumpjet F-35B - both to buy and to operate. It will be unavailable for maintenance far less often (the F-35B is the world's only supersonic stealth jumpjet - it is one of the most complicated machines in the world and will be a maintenance nightmare). The F-35C, unburdened with the B's vertical thrust equipment, will also offer much superior performance. So the tailhook jet is both better and cheaper. And, perhaps best of all, British carriers equipped with catapults and arrester gear would also be able to play host to many other kinds of tailhook aircraft. This would not only mean that French Rafales or US F-18 Hornets could fly from British decks - it would also mean that the Hawkeye radar craft used by both navies could do so, finally offering the British fleet the proper airborne radar coverage which would have saved so many soldiers' and sailors' lives in the Falklands1. It was well known in Britain that this was on the cards, and so HMSs Prince of Wales and Queen Elizabeth were designed so that they could easily be fitted with catapults should the necessary technology appear. As the British ships are to have electrical transmissions, meaning that they will have ample electrical power to run EMALS without further alteration, installing catapults will be about as simple an operation as one could reasonably ask for. Given all this it was pretty much a no-brainer to switch the planned UK F-35 order from B to C version, and Mr Cameron duly did so in 2010: making the new carriers hugely more useful at a stroke and saving Britain vast sums of money down the road which would otherwise have been spent on expensive F-35Bs and exotic, custom built vertical-landing radar aircraft. Good news for the armed forces and the taxpayers, then. Congratulations Mr Cameron. But it was bad news for a much more influential grouping: the British-headquartered arms industry. It was also very bad news for the Royal Air Force. Jet engine firm Rolls-Royce sometimes gets mentioned in this context. 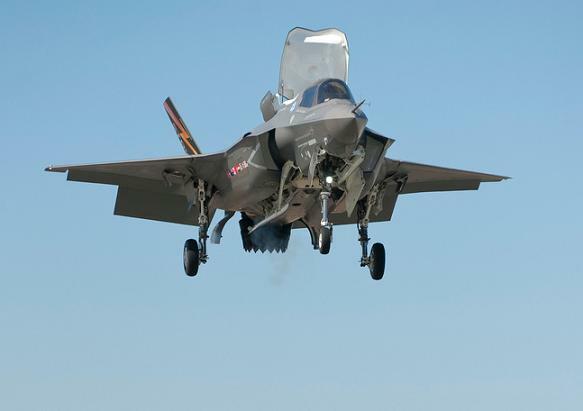 Rolls makes the lift fans and swivelling exhaust nozzles for the F-35B, so they could expect some minor losses of orders with the British shift to the C model. But the US Marines are still going to buy B version F-35s, in much greater numbers than the UK would have done, so it's not a big deal for Rolls-Royce. In any case, Rolls couldn't directly do a lot about the decision. But the shift offered a very damaging prospect indeed to the real monster of the British arms biz, BAE Systems plc. BAE is nowadays mainly an American company, having shut British factories and fired British employees continually for the last 20 years as it used huge revenues garnered mainly from the UK taxpayer2 to buy up US firms. It now employs many more Americans than it does Brits, and makes most of its money in the States. Nonetheless, the company still owns the great bulk of the remaining UK arms industry as part of its global portfolio and it is most unwilling to release its stranglehold on the MoD's budget. The shift from F-35B to C in itself wouldn't directly affect BAE much: it is an F-35 subcontractor, but the parts it makes would be used in either version. And, as discussed, Britain's F-35 purchase of a hundred or so jets matters very little among the thousands of orders expected during the life of the programme. But the catapult carriers are pure poison for BAE nonetheless. Once the UK has a catapult carrier, there will naturally be a push to put some planes on it. No matter what the British government says, there's no realistic prospect of any serious number of F-35Cs being available for much of the ship's early life at the very least. The 2010 SDSR documents projected that Britain would field an air group of just twelve F-35Cs in the early 2020s, and this is almost certainly an overestimate: the F-35C has suffered cost increases and delays since then. Realistically, on current plans HMS Prince of Wales will arrive in service with catapults all complete in just a few years' time, and barely a handful of British F-35Cs - if any at all - will be available to fill her vast hangars, able to hold 40 planes with ease. So the only combat planes able to fly from Britain's new flagship will be F-18 Hornets as operated by the US Navy, or Rafales as used by the French. US and French jets were always expected to be visitors to Britain's carriers, of course: but nobody thought they'd be the majority - or only - users. Next page: And once we had some Hornets or Rafales ... my word the Eurofighter and Tornado would start to look bad. Can we see where BAE and the RAF would be upset?